The writers in question may have told themselves they were hurting Pence by exposing his hypocrisy, but by using the “taxpayer money” frame, they were spreading, however unwittingly, a racist, sexist, classist myth. Although most of us pay taxes of some kind, every time we say “taxpayer money” we prolong the illusion that society depends on certain kinds of people so we can have nice things. One quick exercise shows why. Picture a “taxpayer.” What does one look like? A homeless Black trans teen? An immigrant day laborer waiting on the corner? A young mom trying to cobble together enough income to feed her family, while languishing on the disability backlog? Unlikely. Let’s be honest: We know what sort of people “taxpayers” are supposed to be, and they’re not the ones we should be casting as the aggrieved parties. Calling public money “taxpayer money” implicitly affirms that taxation is theft: If the money is taxpayers’ by right, what business does the government have using it for healthcare, jobs, or clean water? If we’re looking out for “taxpayers” and not the public as a whole, we are favoring wealthier groups over poorer ones—white people over Black people, men over women, U.S.-born people over immigrants, and so forth. We’re hiding how the economic order relies not merely on the sacrifices of “taxpayers,” but the contributions of debtors, tenants, workers, and countless other actors. We’re perpetuating the politics behind the 1970s California “taxpayer revolt,” the 1980s demonization of “welfare queens,” and the Make America Great Again movement—faux-populism that suggests the great majority rely on the wealthy, rather than vice-versa. Look at a dollar bill, and you will see the signatures of its creators: not taxpayers, but the public officials who let the taxpayers hold it in the first place. Money doesn’t grow on rich people. We should heavily tax the billionaire class so we stop living in an oligarchy, but we don’t need private capital for public spending. 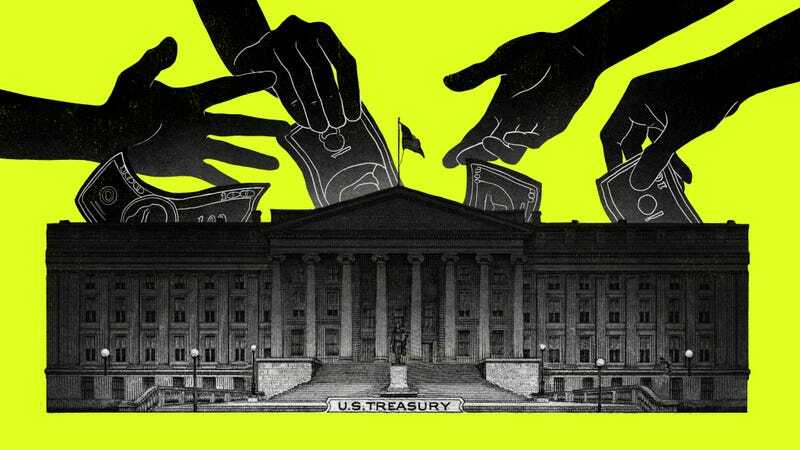 The federal government doesn’t confiscate dollars and redistribute them. It uses its legal power to create and destroy them. Margaret Thatcher’s mantra was backwards: There is no such thing as “taxpayer money,” only public money. Modern money is a creature of the public, and we should use it for public power. We are all the public, and we each deserve a clear, equal say in how our economy and society work, no matter how much we each pay in taxes. It’s time to claim our democratic rights. There is more than enough housing for the homeless, food for the hungry, and medicine for the sick. There is enough low carbon-emission technology to transform our energy system, quit exacerbating the climate crisis, and hire unemployed people all in one fell swoop. And there is more than enough public money to manage it all. Exposing hypocrisy may feel good, but it does little actual good. The people who primarily identify as “taxpayers” are Trump and Pence’s base. Constantly repeating that their “taxpayer money” is being wasted only pressures them to violently defend their property, as the system encourages us all to do under stress. Yelling “Who’s the paid protester, now?” at America’s most basic bigot feels therapeutic, but it’s not powerful. For over 40 years, Democrats have chided the GOP for fiscal hypocrisy. What do they have to show for it? For over 40 years, Republicans have controlled the conventional wisdom around budgets, successfully using the “taxpayer money” myth to force Democrats to “starve the beast,” i.e., cut social spending to actually starve children, veterans, and many others. Calling bluffs didn’t get Merrick Garland confirmed, it didn’t get the GOP to buy into a Heritage Foundation healthcare plan, and it won’t wean support for Mike Pence’s racist political theater. Everybody knows the Republicans are hypocrites and liars, just like everyone knows Donald Trump is a conman, a pig, and a megalomaniac. Yet Republicans now control 68 state legislatures, 34 governorships, and nearly every facet of the federal government. When we reinforce the right wing’s racist, sexist, classist frames in an attempt to expose hypocrisy, we lose. If, instead, we root our politics in what is good and bad, just and unjust, moral and immoral, we can win.